Brother, brother-in-law said to have sabotaged cooking oil bottle. ISTANBUL (Morning Star News) – On the morning of June 9 in southern Yemen, Saeed woke to the sound of screaming. He shot out of bed, pushed panicked family members aside and saw his wife stumbling out of their kitchen, engulfed in flames. 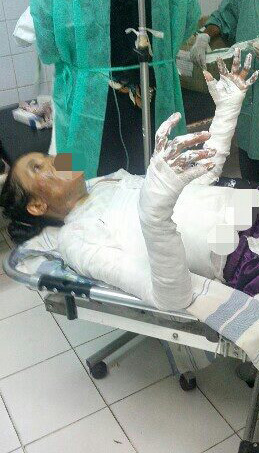 His wife, Nazeera, had been preparing breakfast at about 9 a.m. when she poured liquid from a cooking oil bottle into a hot pan. The liquid flashed, and the bottle exploded. While her four children watched, screaming, Nazeera was being burned alive. 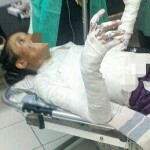 About two weeks later, Nazeera, 33, died as a result of her burns. When Saeed returned to his home in a village (undisclosed for security reasons) after her death, a relative told him the unthinkable – members of both his family and hers had taken the vegetable oil out of the bottle and replaced it with gasoline. Saeed knew the reason – many years ago, the two had become Christians and refused to return to Islam. After living in hiding in Yemen for several months, Saeed was able to flee to the relative safety of another country, he told Morning Star News. Before the attack, Saeed and his wife had already decided to flee their families and the 99 percent Muslim country on the Arabian Peninsula. They got their travel papers two days before the sabotaged bottle exploded. After doctors said there was nothing more they could do for Nazeera, friends of the couple were able to secure a room in a hospital in Egypt for further treatment. Nazeera died that day, before they could go. Saeed was with her when she died. Among her last words to him was not to worry and to take care of their children. Saeed left the hospital and took the two-hour trip back home. There a relative told him that one of his brothers and one of her brothers had conspired against them to punish them. “I was told by one of our relatives that it was a set-up, and they replaced the cooking oil with petrol, which caught flames as soon as she poured it out,” he said. When Saeed went to police for help, officers told him to bring witnesses who could testify about the alleged conspiracy to sabotage the cooking oil bottle. His children only saw the explosion and could not testify regarding sabotage, and Saeed’s relatives refused to incriminate the alleged conspirators, their own family members. Saeed buried his wife and tried to sell everything left in his home, but family members blocked his efforts. Initially his four children lived at his mother’s house after the attack, but he secretly took them to another country before relatives could take them from him. His last image of home was his relatives descending on his house, he said. Saeed, 45, was born into a Muslim family in a small village in south Yemen that he would not identify for security reasons. As a high school Arabic teacher, Saeed read a lot of newspapers to incorporate current events into his classes. In 1997, he was reading an article about a member of the Yemeni Parliament doing something seen as a sin in Islam. Later he was struck by a columnist’s article about the incident urging forgiveness. Saeed married Nazeera in 1998. By 2003, when he began drifting from Islam to become a Christian, he had two sons and his wife was pregnant with their first daughter. All of them, including his wife, followed him in his newfound faith. When people in his village started to notice a change in the way he acted, they started harassing him. At the primary school, things got worse. He was suspended once, he said, for refusing to donate 500 rials (US$2.40) that the school was collecting from every worker for Hamas, a Palestinian Islamic organization designated as a terrorist group by the United States and other nations. In March he refused to give a donation at school to a charitable Islamic association affiliated with another terrorist group. A member of the charity accused Saeed of being an “infidel” and then encouraged another teacher to assault him. The teacher beat him in front of more than 1,000 students. Saeed did not fight back, he said. “But she kept saying that she wanted to be with me, and that she believes in what I believe, and that no matter what, she won’t leave me and the children,” Saeed said. At least one human rights group that advocates for persecuted Christians and a group of Christians assisting Saeed have confirmed the details of his ordeal. One religious freedom advocate said that while today’s headlines are full of stories about terrorist groups brutalizing Christian communities in the Middle East, the day-to-day life and death struggles of converts often go forgotten. “Though clearly an extreme case of persecution, this incident illustrates the pressure converts are under,” said the advocate, who requested anonymity for security reasons. Dear Saeed, great is your faith that sustained you and your family through these difficult times. And your faith has challenged mine. I pray that the Lord will keep you and your family safe. But be assured Nazeera is in a better place now. She’s safe in the arms of the Lord Jesus. I am really touched by our story of Knowing Christ and going through this experience and for your strong faith in Him. That is what Christian faith is all about. But in all such trials and persecutions, He will never Leave us or Forsake us. We can be sure he is working something really good for you. You are your kids will definitely be blessed by Him more and more. And He will provide your comfort each moment of your lives. I am remembering the precious saint Nazeera and the sufferings of my brother Saeed and his dear children this All Saints’ Day. May Jesus hold you close as you walk the rest of your days.